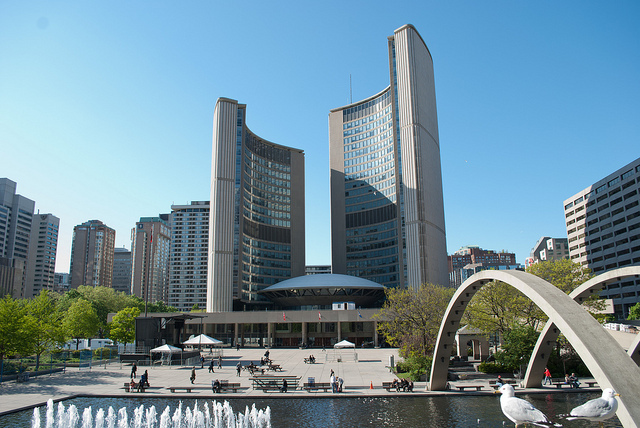 Photo of Toronto City Hall was made available from Gabriel O'Brian through the creative commons on flickr. Canadians and Americans breathe the same air, drink the same water, and share the same responsibility to ensure that future generations have a safe, clean and healthy continent. Stewardship of the shared environment is a key element of the Canada-U.S. relationship as the countries work together to anticipate and address environmental challenges. Climate change is a global challenge requiring a global solution. Reducing greenhouse gas emissions is a step both North American countries are trying to take. Canada and the U.S. have similar targets for reducing these levels. Both countries are interested in utilizing biofuels, strengthening energy efficiency standards, investing in public transportation, and improving green infrastructure. Canada and the U.S. work through the Clean Energy Dialogue to enhance joint collaboration on the development of clean energy science and technology to reduce greenhouse gases and combat climate change. The United States and Canada share coastlines and more than 300 rivers and lakes (some of the largest in the world) lie along, or flow across the border between Canada and the United States. The two countries share a history of effective cooperation on water-related environmental issues. Canada and the United States share a history of effective cooperation to improve air quality. Air pollution impacts the health of people, plants and animals. Air pollution is a serious problem that requires solutions on both sides of the border. Forests are divided into three categories: tropical, temperate and boreal. Boreal forests form a vast band of primarily coniferous forest encircling the upper portion of the northern hemisphere. They form the world’s largest land-based biome, covering 11% of the earth’s surface, and act as a filter for fresh water, absorb CO2 to mitigate the effects of climate change, and provide habitat for hundreds of species. Canada has 30% of the global boreal forest in a band that stretches from coast to coast, and has more boreal forest that is formally protected than any other country. Canada is committed to the sustainable management of its fisheries resources—as well as marine, coastal and freshwater environments—through conservation and sustainable resource practices. Canada and the United States share many fish stocks that move back and forth across the boundary. In order to manage these valuable resources, Canada and the United States have worked to ensure cooperative stock management and enhancement through a comprehensive set of agreements (e.g. for Pacific salmon, halibut, tuna, hake, and whiting). Canada and the United States also work closely to prevent illegal fishing and enforce compliance with international fishing agreements. The two countries work together through a number of multilateral fisheries organizations. Canada is committed to the strong and effective enforcement of environmental and wildlife protection legislation. Conservation of wildlife species and their habitat is a top priority. Canada’s first national park, Banff, was established in 1885, and the world’s first national park service, which later became Parks Canada, was established in 1911. Over the past decade Canada has increased the size of the national park system by almost 50%, amounting to nearly 86,000 square miles of protected land and water with an additional 28,399 square mile set aside for future parkland. Canada’s national parks are established to protect and present outstanding representative examples of natural landscapes and phenomena that occur in Canada’s 39 natural regions. These wild places, located in all of Canada’s 13 provinces and territories, range from mountains and plains, to boreal forests and tundra, to lakes and glaciers, and much more. National parks of Canada are complemented by hundreds of provincial and territorial parks that afford additional protection. The common cause in protecting our wild places is manifest in transboundary parks, such as Waterton-Glacier International Peace Park, shared by both countries. Canada’s parks conserve the habitat, wildlife and ecosystem diversity representative of and unique to these regions. Canada and the United Sates are also partners in the Roosevelt Campobello International Park on Campobello Island, New Brunswick. This international park, created by a treaty signed in 1964, is located on the summer home of former U.S. President Franklin D. Roosevelt and is a testament to the close relationship between the two countries. For the latest environmental news from Canada click here.